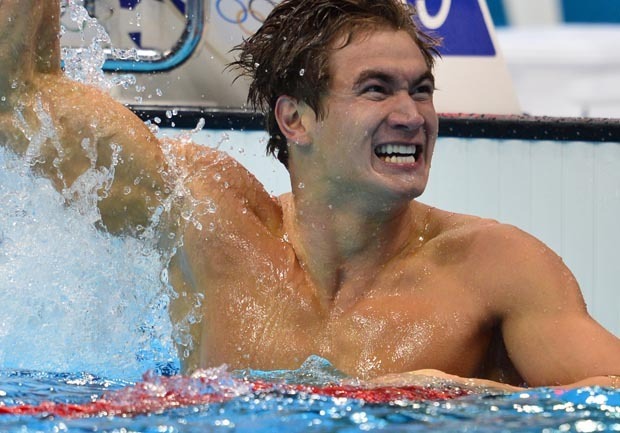 (AP) LONDON - Nathan Adrian took out the Missile by a fingertip. Daniel Gyurta and Rebecca Soni took down two more world records at the pool. Adrian, a 23-year-old largely overshadowed by American stars such as Michael Phelps and Ryan Lochte, made a name for himself by winning the 100-meter Olympic freestyle Wednesday. He lunged to the wall to edge James "The Missile" Magnussen by one-hundredth of a second - the slighest margin possible - and again deny Australia its first individual swimming gold of the London Games. Adrian pounded the water, then put his hands over his eyes while dangling over the lane rope, as if he couldn't believe the "1'' beside his name. Magnussen hung at the end of the pool, staring straight ahead at the wall in disbelief, the wall he got to just a fraction of a second too late. "I had no idea, to be honest," said Adrian, whose winning time was 47.52 seconds. "I'm a guy that has a lot of speed and I can go out fast and I die a little more than he does. It's a little nerve-racking the second 50. I just had to really focus on it and stay strong." Gyurta set his world record in the 200 breaststroke, needing every bit of it to hold off Michael Jamieson's furious bid for Britain's first gold at the pool. The Hungarian touched in 2 minutes, 7.28 seconds, shaving 0.03 off the previous mark set by Christian Sprenger of Australia at the 2009 world championships in a now-banned bodysuit. Soni showed plenty of speed in the women's 200 breast - and it wasn't even the final. Swimming a semifinal heat, the American touched in 2:20.00 to break yet another of the bodysuit records, a time of 2:20.12 set by Canada's Annamay Pierse at the '09 worlds, the fifth world mark to fall at the London Games and further proof it's still possible to go fast - really fast - in textile suits. "Whoa, Rebecca just set a world record," Adrian said as he watched Soni's race on television while talking to reporters in the mixed zone. "I'm overshadowed by Rebecca setting a world record." He should be used to that by now, swimming for a team that includes Phelps and Lochte. But Adrian gave a glimpse of his potential in the 4x100 free relay, going faster than Magnussen on the opening leg, a stunner given the Missile had looked unbeatable at last year's worlds and set the fastest time ever in a textile suit (47.10) at the Australian trials in March. Unfortunately for the Aussies, Magnussen hasn't been at his best when it really mattered, and these Olympics are turning into a bit of a bummer for the swimmers from Down Under. "I just felt pretty much bullet-proof coming into this Olympics," Magnussen said. "It is very humbling." There was even more heartache for the Aussies in the last event of the night, when Allison Schmitt chased down Alicia Coutts to give the Americans goldin the 4x200 freestyle relay. Schmitt dived in the water about a half-second behind, but passed Coutts on their first return lap and won going away in 7:42.92. The Australians settled for another silver in 7:44.41, while France took the bronze. Schmitt is turning into one of the biggest American stars of the games, picking up her second gold to go along with a silver and a bronze. Seventeen-year-old Missy Franklin also picked up her second gold swimming the leadoff leg, and Dana Vollmer claimed her second gold in London. Shannon Vreeland rounded out the gold medal-winning quartet. Adrian came through with the race of his life, giving the U.S. its first title in swimming's signature event since Matt Biondi at the 1988 Seoul Olympics. Canada's Brent Hayden took silver in 47.80, his country's first medal ever in the furious down-and-back sprint. "We were in the ready room and we watched it and just went nuts," Lochte said. "We were screaming and everything. That was one of the greatest finishes. We're so happy for him." Jiao Liuyang of China set an Olympic record to win the women's 200 butterfly. She was second at the final turn but sprinted into the lead to touch in 2:04.06 seconds, 0.12 quicker than countrywoman Liu Zige's time at the 2008 Beijing Games. Mireia Belmonte Garcia of Spain took silver in 2:05.25 and Natsumi Hoshi of Japan finished in 2:05.48 to take bronze. Gyurta trailed two-time defending Olympic champion Kosuke Kitajima midway through the men's breaststroke, but seized control on the third leg as the Japanese star began to fade. Making the final turn, Gyurta seemed to be in control. Then, as he popped up and down in the water, heading for home, Gyurta suddenly felt Jamieson surging up on his right shoulder. The Olympics Aquatics Centre was in a frenzy as the two approached the wall, but Gyurta got there first. Jamieson nearly broke the old mark, too, settling for silver in 2:07.43, while Ryo Tateishi of Japan took bronze in 2:08.29. "I've received so many messages of support and I was desperate to get on the podium to thank everyone," Jamieson said. Kitajima was edged for a spot on the podium by six-hundredths of a second. His countryman Tateishi slapped the water when he saw his third-place position, while Kitajima was again denied in his bid to become the first male swimmer to win the same individual race in three straight Olympics. Back to you, Mr. Phelps. While the American has missed on his first two tries at an unprecedented threepeat, finishing fourth in the 400 individual medley and second in the 200 butterfly, he's got two more chances to pull it off: the 200 IM and the 100 fly. Kitajima is done, except for a possibly relay. One night after becoming the most decorated Olympian ever with his 19th medal, Phelps had a relatively light day, swimming the prelims and semifinals of the 200 IM. Lochte also competed in the medley, as well as the two rounds of the 200 backstroke - one of his toughest days in London. Lochte posted the second-fastest time in the backstroke semis, his time of 1:55.40 trailing only fellow American Tyler Clary's 1:54.71. Then, in the IM, he was fastest in 1:56.13, ahead of Hungary's Laszlo Cseh (1:56.74) and Phelps (1:57.11), whose mind might have been on other things. On the way to the pool, Phelps got a call from President Barack Obama, congratulating him on becoming the most decorated athlete in Olympic history. Ranomi Kromowidjojo of the Netherlands set an Olympic record to lead the women's 100 freestyle semifinals, while defending champion Britta Steffen of Germany failed to advance. Kromowidjojo was timed in 53.05, seven-hundredths faster than Steffen's swim at the 2008 Beijing Games. Melanie Schlanger of Australia qualified second in 53.38, while Franklin was third in 53.59. Steffen was a dismal 12th out of 16 semifinalists.